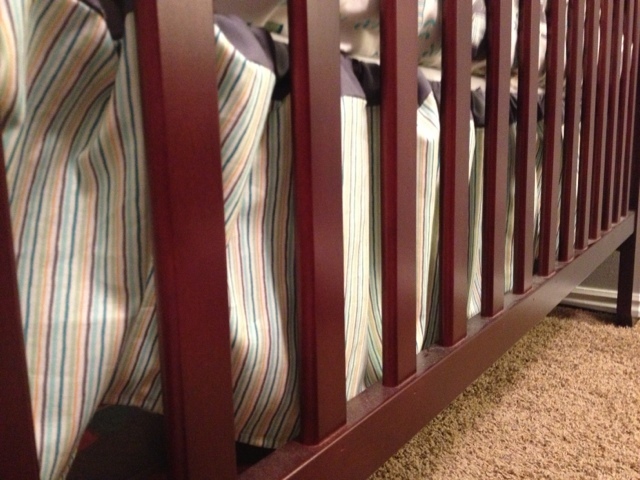 Time for the next tutorial in the Crib Set Extravaganza line (sheet)! 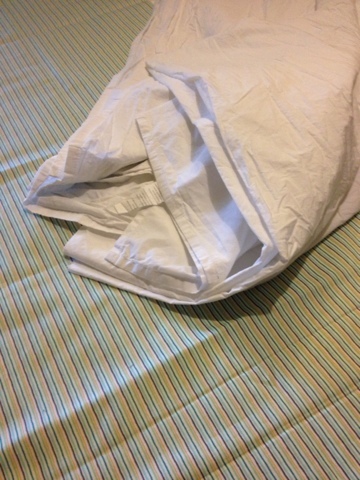 The bed skirt. 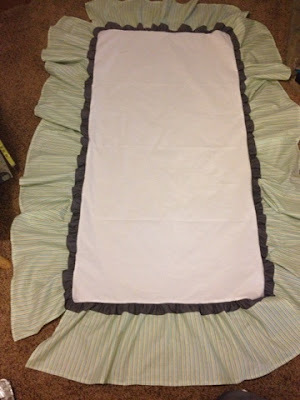 A while ago, I posted a tutorial for a re-fashioned bed skirt. This is a tutorial for making the whole thing "from scratch..." Plus this one's for boys and not pink! *Here's the link for the bumper pads. 1. Of course we have to start with cutting out the material. You can go to the store and buy some material (any material will work for this part) or you can use an old sheet and cut it up! 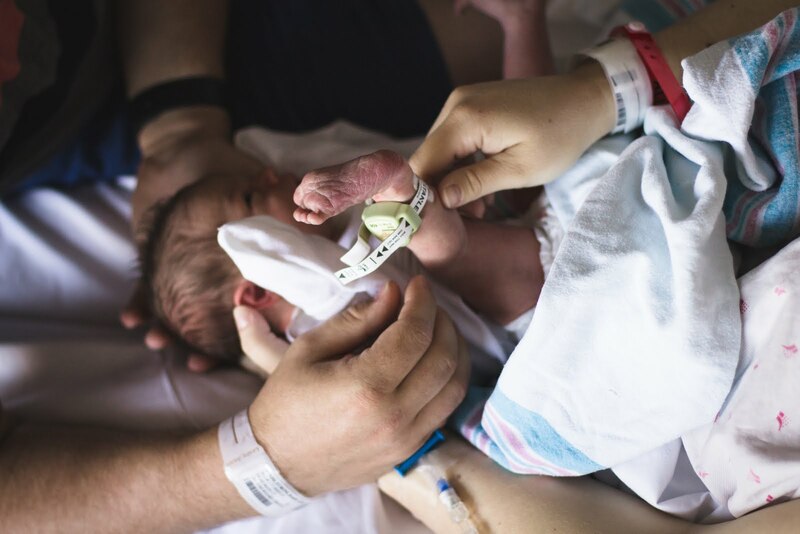 Measure a rectangle 27x52" (measure your crib size to make sure!). Cut and iron. 2. 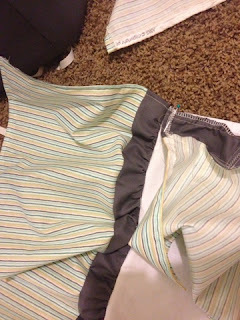 Next, you must decide if you want your skirt all out of one material, or if you want a band around the top or bottom. I did a band around the top of my skirt and I LOVE how it turned out! So, if you want the band, make marks at 9" intervals down the entire length of your material along the fold, you should have enough to make 5 marks (to cut out 6 pieces that are 9" each). Cut and iron. 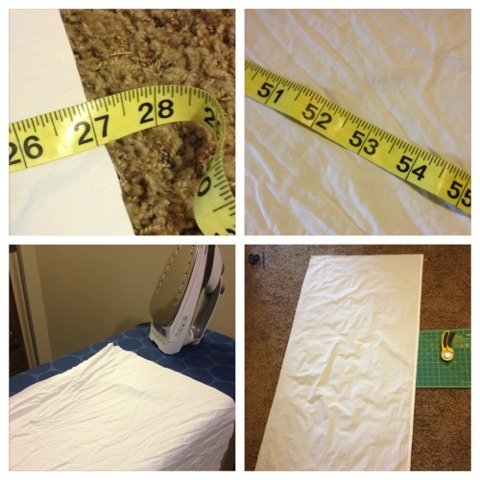 *If you want the skirt all out of one material, make marks at 11" intervals, cut, then iron. 3. 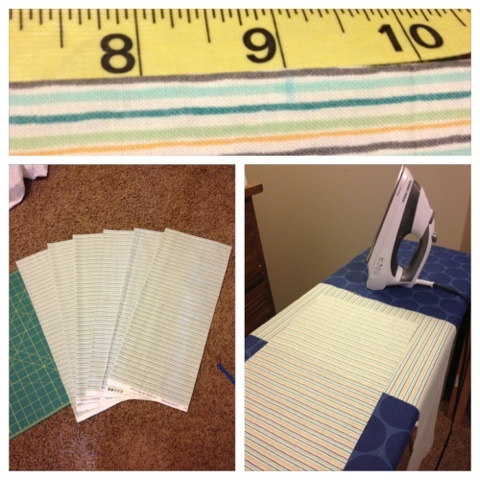 For the band, cut out 2 1/4" (more if you don't have a serger and don't want to zig zag stitch or if you just want your skirt longer than 10 1/2"), to the same length as your 9" pieces. 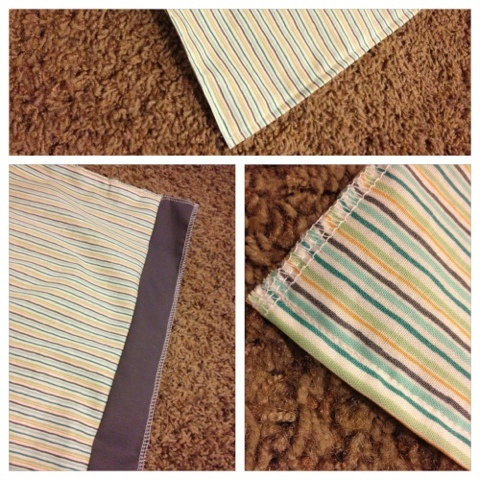 Pin the 9" fabric to the 2 1/4" fabric (right sides together), and straight stitch them together. 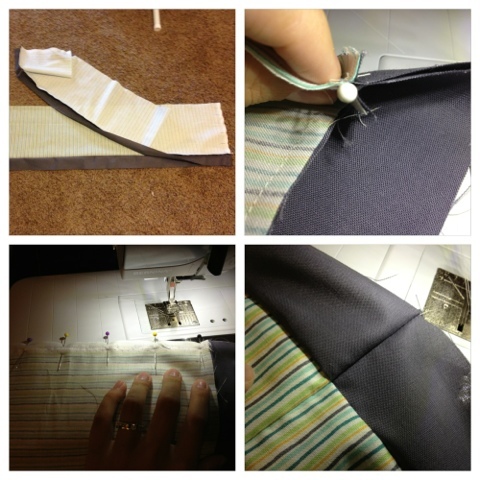 Follow that up with a zig zag stitch so that your fabric won't fray. 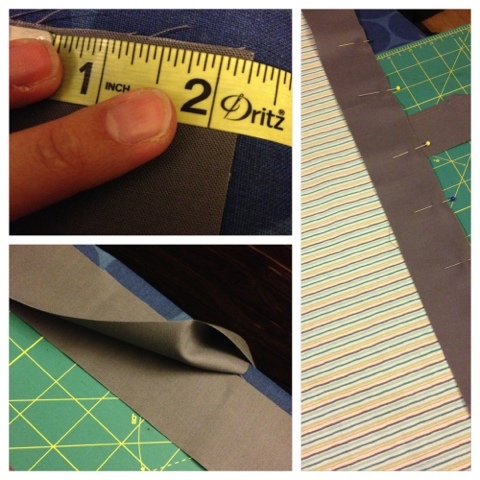 If you have to sew a couple of 2 1/4" pieces together to make it the same length as the 9" piece, just be sure to zig zag stitch! 4. The next step is to sew two of your new pieces together. Be sure to pin the pieces together beginning at the seam line of the band so that they will line up. 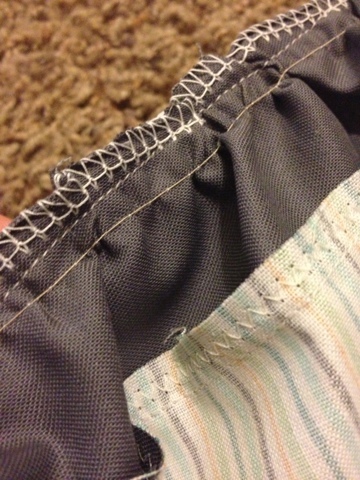 This part of the skirt will be the longer side of your crib. Your new piece should be around 75-90" long. Just make sure it's at LEAST 75" long. Do the same thing with two more pieces. You will now have all four sides of your bed skirt completed. 5. Next, serge (or zig zag stitch) all four sides of all four pieces and around all four sides of your 53x28" bed piece (or, if you don't mind spending the extra time, double hem each side). Hem the sides and then the bottom of the skirt. Leave the top un-hemmed. 6. Gather. 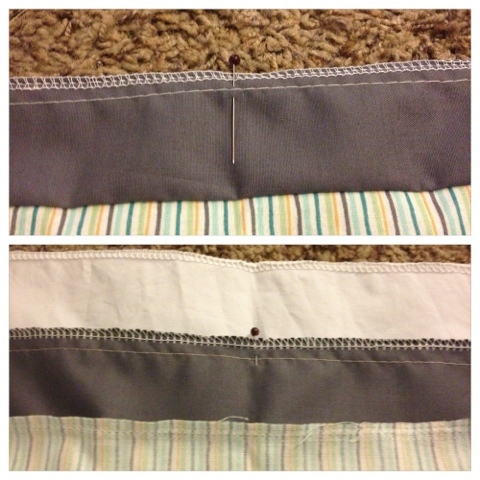 Set your sewing machine to do the longest straight stitch and choose if you want the 2 1/4" band around the top of your bed skirt or bottom. I've done both, and they both look good! 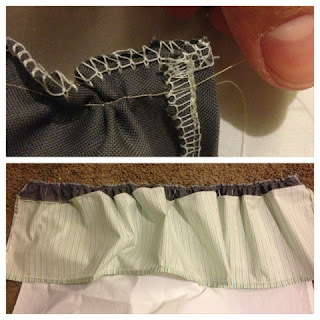 Do a long gathering (basting) stitch across the top of your bed skirt pieces. 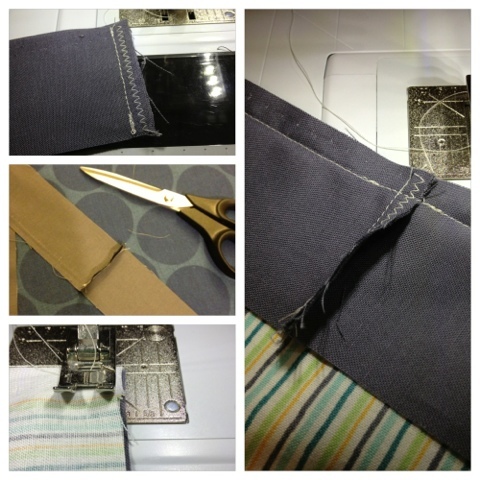 Leave a tail of thread at the beginning and end of your gathering stitch. 7. Now, line up your skirt piece with your bed piece and pin the middle of the skirt to the bed piece. Pin at the middle to hold it in place (lining of the edges and making sure that right sides are together, of course!). 8. Take one of your tail strings (just one thread, not both tails!) and pull. Slide your material down until the edge of each piece is lined up. Do the same on the other side. Now your skirt and bed piece side are the same size. Pin in place and do the same on the other skirt pieces around your bed piece. 9. 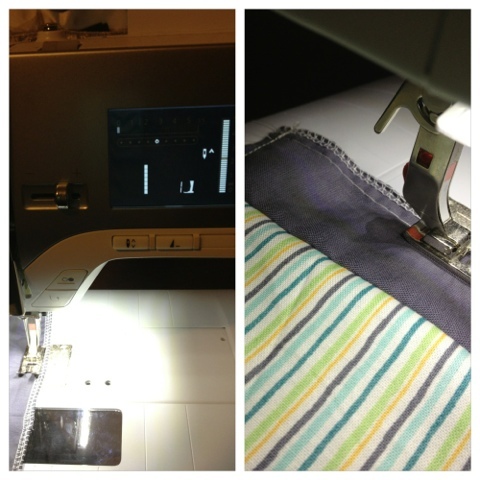 Now straight stitch (set your machine back to a normal straight stitch) the skirt to the bed piece, zig zag any exposed edges and you're done! And here's the pink one I did for Chelsea's room! Tune in next week for the last part of the crib set extravaganza: The bumper pads!